The basic diode is a device that allows electric current to pass only in one direction. Diodes are often also called rectifiers. The term diode usually implies a small signal device with current typically in the milliamp range. A rectifier implies a power device capable of conducting from 1 to 1000 amps or even higher. The diode is the most basic solid state device, although it also existed as as part of vacuum tube technology. Solid state diodes or rectifiers are normally identified with a marking beginning with "1N" (e.g. 1N4001). Smaller diodes will have a band on one end indicating the cathode side of the diode. Power supplies converting alternating current to direct current. Logic circuits in an "OR" configuration. Current flows through the diode when a forward bias exists. A forward bias occurs when the positive side of the votltage source is connected to the anode and the negative side to the cathode. Using conventional current, current flows through the diode from the anode to the cathode, or in the direction of the arrow on the schematic symbol. When a reverse bias exists, the positive side of the voltage source is connected to the cathode. With a reverse bias, the diode blocks any current from passing, well almost. When current passes though a diode with a forward bias, there will be a slight voltage drop as the current passes through the diode. This is called the Forward Voltage Drop (Vf). For silcon based diodes (the most common), Vf will be approximately 0.7V. The Vf for germanium based diodes is only 0.3V. When the forward bias is less than Vf, the diode restricts the current passing through it. Above Vf, the diode passes current with relatively little additional voltage drop. The Current Rating for a diode indicates how much current can pass when forward biased. Ideally, when a diode is reverse biased, no current would pass. 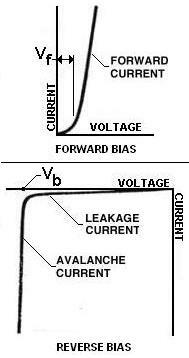 In reality, a small amount of current does pass and is called Leakage Current. The leakage current is typically in the μA range. Diodes also have a point where they can no longer hold back the current, called the Breakdown Voltage (Vb). When the reverse bias reaches this point, the diode fails to hold back the reverse current. A diode used in a simple circuit converts an AC wave into pulsating DC. This can be demonstrated using a graph of an AC waveform. The AC waveform is illustrated as the AC Input below. This graph illustrates how the current changes over time. The current is depicted on the vertical scale and time on the horizontal scale. It should be recognized the resulting wave is typical of a sine wave. The current flows one way when the waveform is above the horizontal line and flows in the opposite direction when the waveform is below the horizontal line. When a diode is inserted into the current path, the current can only flow in one direction, illustrated as DC Output. Note in the simple diode circuit that there is a period of time when current flows and an equal period of time when current does not flow. In many circuits, this interuption of current flow is unacceptable. The flow of current can be made more constant by the use of multiple diodes in a configuration called a bridge rectifier. A bridge rectifier provides multiple paths for current, based on the polarity of the input. 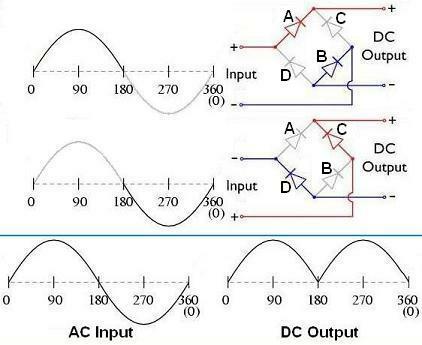 When the input AC is in the first (top) half of the waveform, the current flows out through diode "A" and returns through diode "B". Diodes "C" and "D" block the flow of current because they have a reverse bias. During the second (bottom) half of the waveform, the current flows out diode "C" and returns through diode "D". Diodes "A" and "B" block the flow of current because they have a reverse bias. When the two half cycles are put together, current is passed over the entire AC cycle. The ripples in the pulsating DC can be further reduced by the simple addition of a capacitor across the DC ouput. The capacitor charges as the output reaches a peak and and discharges when the output goes to zero. Zener Diodes: diodes that can be made to conduct backwards. This effect, called Zener Breakdown, occurs at a precisely defined voltage, allowing the diode to be used as a precision voltage reference. Light-Emitting Diodes (LEDs): as the electrons cross the junction they emit photons. With the right materials and geometry, the light becomes visible.